The combination of Governors elected under the platform of the ruling All Progressives Congress (APC) and the opposition Peoples Democratic Party (PDP) have met with President Muhammadu Buhari, who has spent almost three months abroad taking care of his health. Earlier in the week, chieftains of the APC, which included two Ministers, about four Governors and National Chairman of the party, Mr John Oyegun, were in London to see the President. However, there were claims that the picture released to show the visit was not original. It was alleged that the photograph was taken at an earlier separate event in Nigeria. However, yesterday, the Presidency said Governors elected under the platform of the APC and the PDP will visit Mr Buhari today at about 3pm. 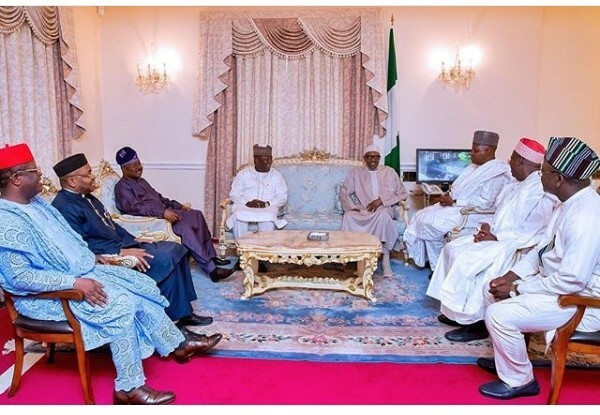 In the pictures released, the Governors were seen having a nice laugh with the President as well as his wife, Mrs Aisha, who was once reported not to have been allowed by a cabal to see her husband when she visited him some weeks ago. It is not certain what critics of the President, led by Governor Ayodele Fayose, will say now of the latest pictures of the President with the Governors released to the media today.